It’s very tempting to let leaves stay on the lawn but by doing so you take the risk of the rotting matter weighing wet and heavy on the lawn killing the grass and promoting fungus conditions. Leaves only make a good mulch if they have been shredded. You should also cut back dead growth so beds are clear for new growth in spring. Make sure your fall yard clean-up includes taking away any fallen twigs or branches. If you have or can rent a tiller that will make this chore much quicker, but if you don’t, make the effort to turn over the soil with a shovel in your vegetable garden. It helps eliminate weeds and loosen the ground. If you’ve been cultivating compost, now is the time to add a layer to the garden. These tasks will make your soil so much richer for a spring planting. All trees and shrubs will have a time when they start to outgrow their environment. 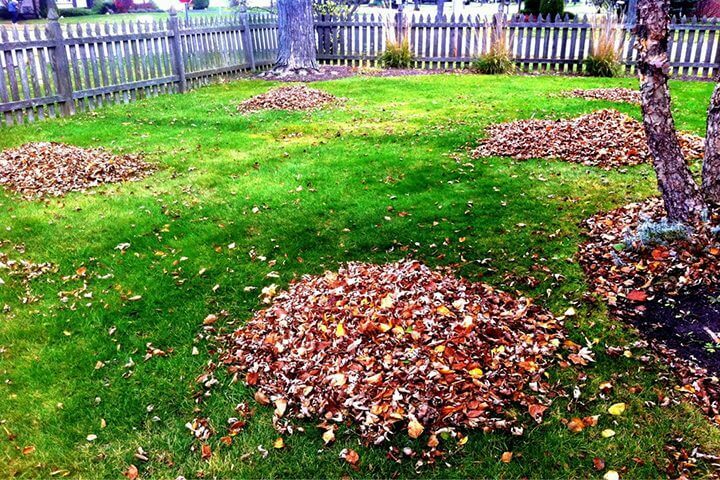 Your fall yard clean-up is a good time to get them under control. Be sure, though, to know what you are trimming because some blooming shrubs should not be pruned until after their spring bloom period. Be sure to drain all water from fountains and drip irrigations systems. All it takes is one really cold night for the moisture to freeze and crack your equipment. This includes hoses which should be completely drained and brought inside. Not all fall yard clean-up is at ground level. Leaves, twigs and bird nests can quickly clog up the gutters. While everyone is in work mode take the opportunity to remove all gutter debris. When finished rinse with a hose to make sure all matter is cleared out. If you want to enjoy a lush green lawn next spring, aerate your yard to break up the soil and encourage nutrients to reach into the root system. Most people don’t own aerator equipment, but it can be rented for a small cost. You had to know this task was coming. Your yard soil has been broken up and that makes it the perfect time for a fall feeding. When you lawn is bright green in the spring you will be the envy of the neighborhood. If you have flower beds and tender shrubs a thick layer of mulch will get them through the winter with a warming cover. Invest in a finely shredded matter or consider a rich compost that will also add nutrients into the soil. Sure this step can be done in the spring but if you make it part of your fall yard clean-up the flowers will come up nicely without their early growth being interrupted. You are also more familiar with growth pattern and plant size at the end of the season while in the spring you’ll have to rely on memory to recall what needs divided or moved around. Think about it – every spring don’t you see beautiful tulips and daffodils growing in the neighborhood and thinking you wish you had thought ahead to put in some of your own? Just do it. Nothing brightens up the early spring landscape like colorful blooms. It’s so tempting to dump your tools in the garage after a hard day of yard work, but taking the time to clean them every fall will extend their life span and ensure good working condition. A light coat of oil will also help prevent rust over the winter. This may seem like a long checklist for your fall yard clean-up but the tasks should go quickly and you will feel so productive when finished. Honest! Plus in the spring when you want to get out of the house to hike or play that first round of golf you will have the time to do just that. And your fall yard will be on its way to looking terrific.